Chris Read enjoyed a day to remember as Nottinghamshire Outlaws maintained their unbeaten start in the Royal London Cup with a four-wicket win over Sussex Sharks at Hove. 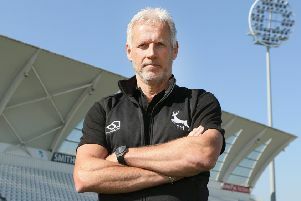 Having earlier become the first Nottinghamshire wicketkeeper to take six catches in a one-day innings, the 36-year-old calmed his side’s nerves when they lost their sixth wicket with 53 runs still needed, contributing an unbeaten 22 to a stand of 56 with Steven Mullaney, who won the game with a six as he finished on 42 not out, Nottinghamshire securing their second Group B victory with 22 balls to spare. Sussex had earlier squandered the advantage of winning the toss on a flat pitch. Openers Luke Wright and Chris Nash put on 96 in 12 overs but after they fell in successive overs to Jake Ball they struggled for momentum and their total of 282 for 9 never looked like being enough, even though Thomas trapped Rikki Wessels leg before with the first ball of the reply and Alex Hales (23) spliced a pull at Tymal Mills in the sixth over. James Taylor, who made a career-best 291 in Nottinghamshire’s Championship win over Sussex last week, appeared in the mood to hand out further punishment to his favourite bowling attack, flaying eight fours and a six in a 41-ball half-century. Taylor paid the penalty for over-confidence when he lost two stumps trying to work Chris Liddle through leg but his namesake Brendan and Samit Patel put on 71 with few alarms to get the target to under 100 halfway through their reply. Brendan Taylor gave Liddle a return catch after making 62 from 60 balls (8 fours, 2 sixes), Patel (38) was yorked by Mills’ slower ball and Dan Christian holed out to long off to give Sussex a glimmer of hope but Read and Mullaney ensured there were no further alarms. Earlier, the Outlaws pulled things back well after Nash and Wright plundered 14 boundaries between them in the power play on an easy-paced pitch before Ball pegged Sussex back with a spell of 3 for 8 in his first three overs. Wright (40) and Nash (49) both gloved mis-timed pulls while Matt Machan was caught on the crease to give Read his third success. From 108 for 3 in the 16th over Sussex were forced to rebuild and although all of their middle order batsmen got starts no one played with any sort of authority until Will Beer, coming in at No.8, hit 42 from 55 balls. Craig Cachopa briefly hinted that he could when he twice deposited Patel over long on for six but Australian Christian, whose first over went for 14, conceded 16 from his next five and picked up both Cachopa (18) and skipper Ed Joyce (21). Ball finished with 4 for 49, his figures slightly spoiled when Thomas, who has joined Sussex on loan for the competition from Somerset, hit ten runs off his last two balls in an unbeaten 32.